Lower Hatea River crossing in New Zealand, designed by Knight Architects, is a striking realisation at the centre of Whangarei District Council’s 20 year transportation strategy which is now in its final stages. Officially named Te Matau ? 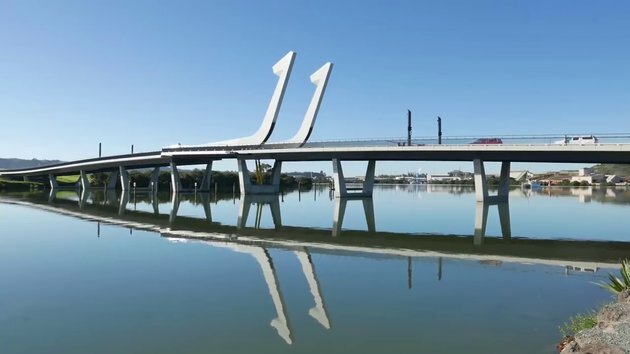 Pohe or “The Fishhook of Pohe”, the rolling bascule structure is designed to be recognisable by day and night, providing a positive gateway to the town basin area and as a structure that speaks strongly of the local character and culture of Whang?rei. The project is now the subject of a breath-taking drone film which shows the intricacies of the function and form of this unique structure. My son and daughter in law just spent a year working and then traveling all over the two islands of New Zealand, including this bridge. It must be a beautiful country! wait...its a good bridge...but couldnt they just have built the bridge higher with that budget? @4. WOW .... Are you mentally ill? Trump Derangement syndrome much? Wow who brings up "trump" in a video about an amazing bridge in New Zealand. You should get yourself checked out.... obsessing over trump is a mental illness since your comments online will change NOTHING, hes the president of the USA , deal with it. Im not a pro trump either I just see this BS from weak minded people. DEAL WITH IT, Trump IS president and he will be president again in 2020.